I love Blank Canvas Cosmetics (BCC)! There isn't anything bad I can say about this brand and their line of brushes. In January I placed an order for their 15 piece set (click here to read the review) and just fell in love with their brushes! A few months back, while surfing the next, I found on Blank Canvas's facebook page that they were launching there new multi-color Kabuki set. Now what is a Kabuki brush you may ask? Well let me tell you! 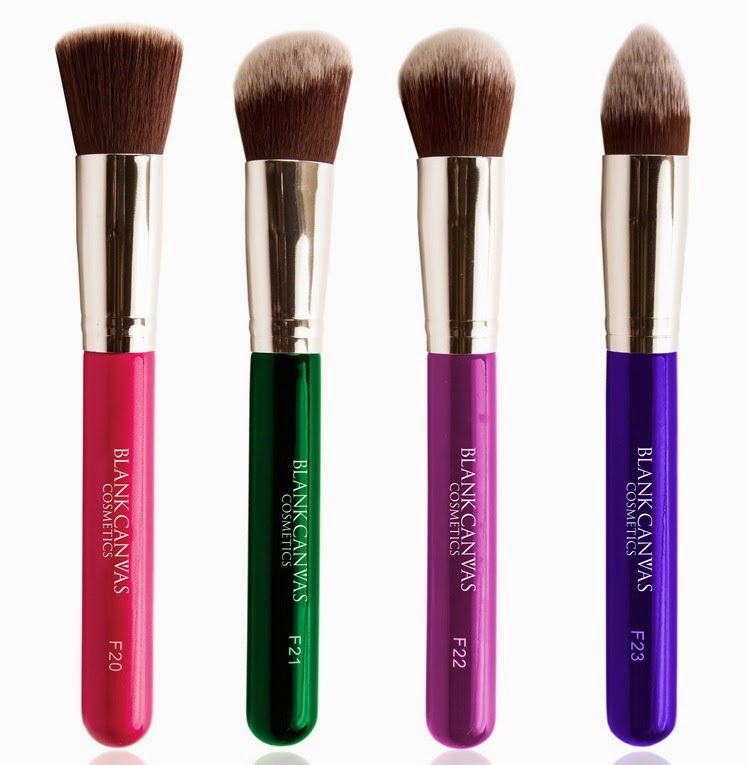 Kabuki brushes are used to buff in your makeup. You can use them for mineral, liquid and powder makeup. They are very dense and the bristles are made just so, so that the majority of your makeup does not get adsorbed into the brush and it leaves behind a prefect flawless finish. I currently owe a BCC F20 (pink) and I love using this to apply my foundation with. It literally gives me a flawless complexion that I have never seen with using any other makeup tool. There are no harsh lines left behind that you get from a makeup wand or sponge. I was looking into buying the F22 & F23 and had it on my wishlist when I realized that BCC was selling these beauties in a bundle for a sweet deal! So naturally I had to buy it! While each brush can be used for many different reasons, nonetheless each one has a specific design in mind! The F20 Flat Top Buffer Brush & F22 HD Dome Face Brush can be used to buff in your cream or liquid foundation. The F21 HD Angled Contour Brush can be used to contour your face with. Since the brush is angled, it works great to draw the contour lines on your forehead and hallows of your cheeks in a diagonal line. The F23 Pointed Tip Face Brush has a pointed head which is great for grabbing your concealer and dragging it down into place and getting in right underneath your eyes. This set also comes with a traveling case. When I bought mine at that time, the case wasn't being offer. However the case looks sturdy and great way to keep your brushes clean and sanitized why on the road! If you are looking to buy a Kabuki set for your foundation, concealer and contouring routine, then I highly recommend these brush! For the price, you won't be disappointed!